Creative Commons Attribution: You are free to use for personal/commercial use. But, you must attribute the work to the author. Should not remove credit links. After installing this template, Go to Settings -- Language and formatting page. Change the Date Header Format to Wednesday, May 8, 2013 like format. Go to Layout page and click edit on Recent Posts widget. Then, paste the following code. This will display 5 recent posts. Change the website url in script src to your website url. If you don't like this widget then just delete it and add your own. 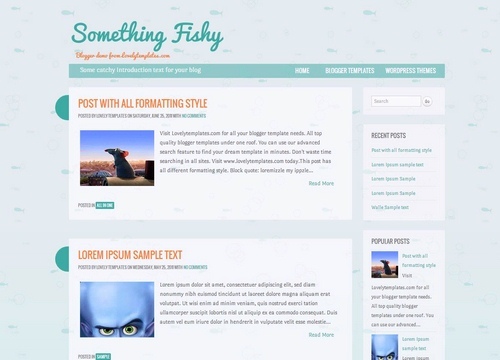 This template is Search Engine Optimized by Lovely templates. We are using Search preferences options for meta description. Go to settings -- Search Preferences and enter a description for your site. This description will come as meta description for your home page. Helpful for Search engines. Also, you can add meta descriptions for every page you create in blogger. This template is completely optimized for SEO by Lovelytemplates.com.